From sustainable gardening to bamboo construction, life at the single mothers’ home is about more than just babysitting. As a gardening and construction volunteer, you’ll play a role in steering disadvantaged single mothers onto the path to self-sufficiency. For volunteers, the day starts at around 9:00 am, but you’ll probably find the work in progress when you arrive on the site. The first thing you’ll hear is the two-wheeled “steel buffalo” rattling through the on-site rice paddy. Here on the gateway to the rural north, against a backdrop of jungle-clad mountains, it’s easy to forget that you’re only minutes from Chiang Mai city proper. Your daily tasks vary according your skills, the compound’s needs and the season of your assignment. The most pressing need is for hands-on construction. This single mother’s home is growing fast, and homes are needed not only for the mother’s and their children, staff, administration and volunteers, but also for the live-in construction team. 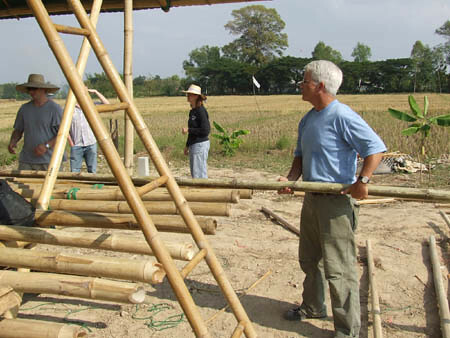 During your tenure on this assignment, you’ll learn the tricks of building with one of nature’s most sustainable building materials: bamboo. Every jointed pole has to be treated and sealed before it’s tied off into frames or slatted into walls. Depending on current phases, the crew may also need help laying cement foundations or painting. Gardening is another major component of this project. 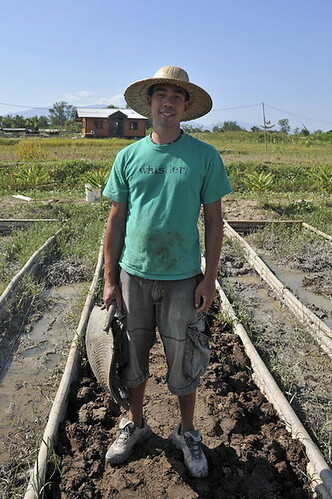 Some of the rice and produce eaten on the compound is sustainably and organically grown here. The single mothers, staff and volunteers do it all: planting, watering, fertilizing, pruning and harvesting. This is the kind of hands-in-the-earth solidarity that travel agencies wish they could offer. But don’t sweat the heat. If the wide-brimmed hat isn’t doing its job anymore, there’s plenty you can do in the shade. You’ll also have a midday break where you can study Thai, get to know the employees or catch a quick nap. Assisting single mothers in their efforts to gain skills needed to survive and prosper will be your number-one objective. Many of these women hail from the mountains of Northern Thailand. They represent marginalized ethnic groups that are too-often overlooked, and they’re unaccustomed to strangers taking an interest in their welfare. You’re an ambassador, of sorts – a vote of confidence that simple kindness exists outside the village. Part of the foundation’s goal is to equip disadvantaged mothers for successful careers. There’s a good chance you’ve got a skill worth sharing, and you’ll be encouraged to do just that. Most of the single mothers and their children have little-to-no English background. They take regular classes, and fluent volunteers are an invaluable resource. Computer skills training, how-to handicraft demonstrations and just about any form of cultural sharing are also in high demand. Simply being on-site to help out with the chores is a great help. Many of these disadvantaged women hope to return to their villages one day, and the gardening and construction skills they learn here will be of direct benefit in that setting. Just having an extra set of hands around frees them up to focus on picking up a new skill or refining an old one. And who knows, you may pick up a skill worth taking home with you as well. The minimum age requirement for volunteers in this project is 20. Due to having to work outside and spend a lot of time in the heat, the home requests for volunteers to be in good physical condition. Volunteers should have a basic knowledge of building and tools, be between the ages of 20-40 and able to work in the heat. Volunteers should be able-bodied, flexible and enjoy working outside. Participation in the Building Volunteer Project at the Single Mother’s Home starts at $999 for four weeks. Each additional week is $119.